There are different types of hand carved letters that can be used on a variety of natural stone. These are V Cut, Lead or Raised Lead Letters. These days, the V Cut is now the more likely choice of lettering style; the effects are stunning and especially when hand carved it provides a long lasting inscription. Hand carving gives a depth to the letter and so is much richer than the machine cut or sand blasted. At Stone Man we can advise on fonts and finishes depending on the type of stone chosen and consideration should also be given to where the stone is sited with regards to weather conditions. This the traditional style of hand carving. It can be carved into marble, slate, sandstone and granite. The letters will have a deep V cut, which depending on the stone and your taste can be left with a natural cut finish or be painted or gilded. Stone Man offer both gold and silver gild as finishes plus a variety of enameled paint. Any style of font can be used, the usual font will be Times Roman in upper case but mixing both upper and lower can be more pleasing to the eye. Lead letter inscriptions are very traditional and are quite often seen in Churchyards and older cemeteries and more often on white marble. First the letter is carved into the stone, lead is then beaten into the letter outline to form a smooth flush letter. It gives a finer look to an inscription and is left unpainted. Not often used as a lettering choice for new memorials these days due to it being more expensive to produce. The effect does though provides longevity to the inscription. 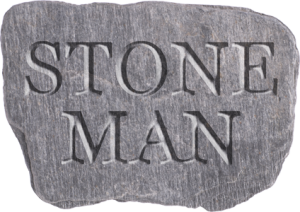 Stone Man is able to fully renovate existing lead lettering and add additional inscriptions, in keeping, if required. Raised Cut Lead lettering is made by hammering lead into the stone and then cutting it into a raised block style letter. This is suitable for use on granite and will have a painted finish, more usually in black. It is not often chosen as a lettering style for new memorials these days but Stone Man is able to repair existing raised lead inscriptions and add additional raised lead inscriptions as required.